So I started smoking over the weekend — chicken that is. So if you were in the fan on Monday and smelled the sweet smell of cherry wood drifting up and down the alleys —yea that was the E.A.T. smoker and I really am going to show you how easy it is to smoke two chickens (check your local farmer's market or whole foods for these chicks). I will assume first that of course you own a smoker. First season your chicken! Salt and pepper in the cavity, throw in some quartered lemons, garlic, parsley — whatever you like. 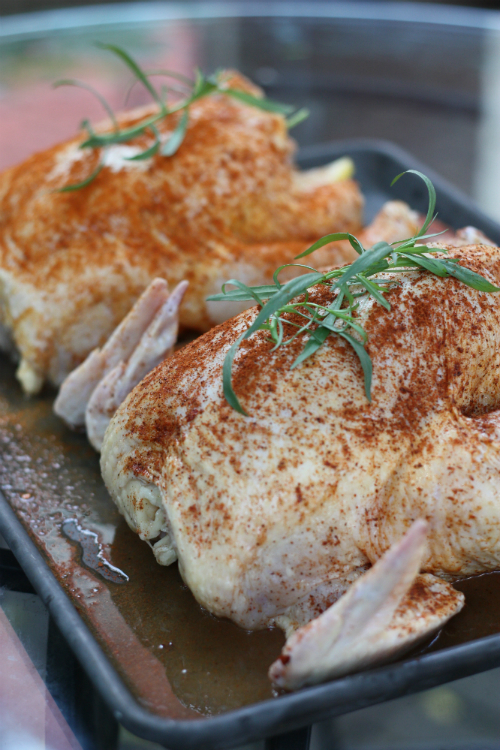 Rub the outside of the chicken with a pre-made rub that you probably already have in your cabinet or you could make up your own with spices from that same cabinet (a great way to use up some of the lesser used ones). Top with a fresh sprig of tarragon from the garden and then we are ready for the smoker. 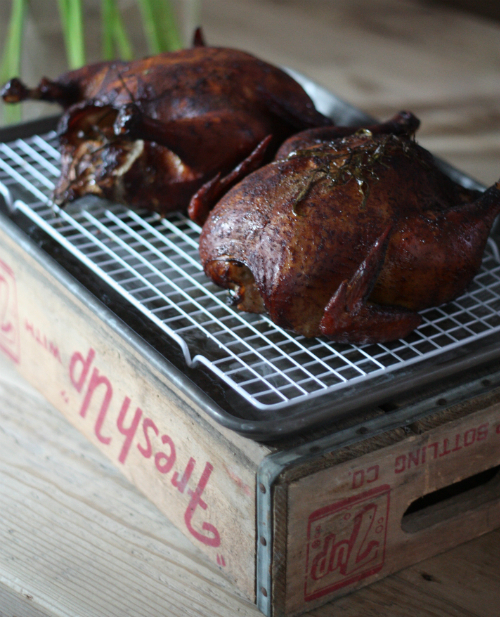 Depending on your smoker, distribute the chickens evenly throughout the grates similar to below. I used some cherry wood that I had gotten, and soaked the larger blocks overnight in water. I always soak my chips or chunks before applying them to the smoker otherwise they really just catch fire and create minimal smoke. 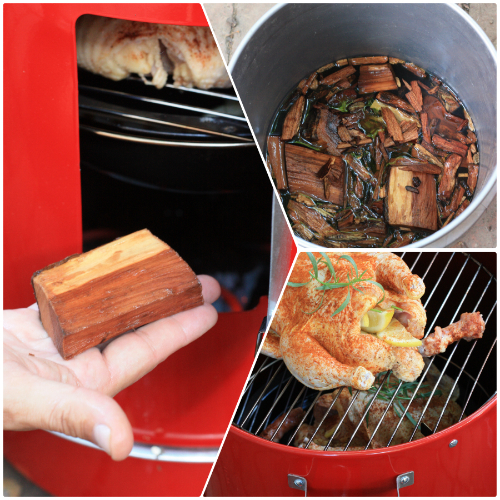 Add wood chips directly to coals or the heating element and then close the lid of the smoker! After about four hours at 200-220 degrees your chicken should look similar to the above. It is good to sit the chicken on a bakers rack on a cookie sheet so as it cools the juices flow out on to the pan — also makes for easier cleanup. Once the chicken has rested for about 10 minutes you can slice and serve immediately which is what we did, reserving one chicken in the fridge to be cut up for a smokey version of this chicken salad created later in the week. 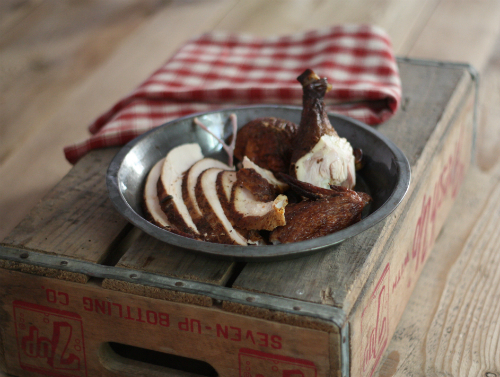 With minimal effort and using the smoker, several delicious, healthy, and tasty meals can be created on the weekend to be enjoyed for the rest of the week. I'm looking forward to continuing changing up the meat and fish varieties on the smoker this summer and sharing these creations with you. 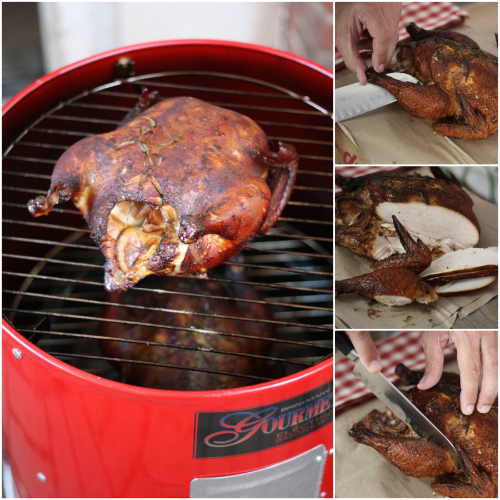 Do you own a smoker or does this post make you want to hop in the car and pick one up? 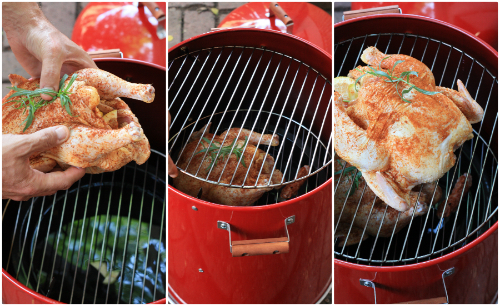 We do this often, but with a weber kettle, not a smoker. Works great. Also, the carcass from a smoked chicken makes incredible broth for chicken soup. We had that for dinner last night with farmer's market spring vegetables and the meat from a few extra chicken thighs shredded in it. Yum. Kathryn, I should have thought of using the carcass for a broth. Now I know and will not miss that next time. Thanks for the tip and for stopping by! Aren't smokers the best thing ever?! I love ours...so do the bears, especially when we have been smoking salmon. Did you know you can also smoke cheese? I've not tried it yet but we have a friend who makes smoked cheddar and it is fantastic. You are the second person to mention smoking cheese. If you can get me some tips on that I would be happy to hear them. I am also going to do some research myself!